Subject: Custom Meeples Have Arrived! Just got mine today also. MeepleSource really did a great job on these. Mine arrived here in the UK today, amazing! Not really going to be more exciting than what you see here, unless you want me to make a monkey pyramid from them? Oh okay then! A quick comparison with their Carcassonne kinfolk for you. Our Meeples would obviously beat up their Meeples! Glad everyone likes them so much! We like them too! I'm so looking forward to the copy of the game that I ordered! Glad to hear they are shipping! Yay! 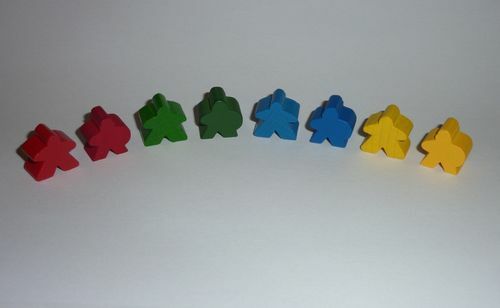 What do these meeples replace? What does the purple structure replace? The Meeples can be used as your score marker and action marker instead of cubes. The purple marker replaces the house-shaped City Marker. There aren't any in my copy. One question again; how do you use the leaf meeples? They are just a reminder to score the breaking ground bonus. Place one on each district during setup, and remove them during play as you score the breaking ground bonus for that district. Correct, and don't put one in the central district (that's why there are only 24 leaf tokens).